Georgia Regents University continues its long tradition of offering innovative, forward-thinking degrees with the launch of its new doctoral degree in applied health sciences. The three-year, practice-oriented doctoral program is the first of its kind in the University System of Georgia, something the Board of Regents noted when they approved the program in March. Designed to equip health professionals with the skills to solve health care issues in numerous fields of allied health, graduates will be uniquely prepared for roles in the health care work force, which is made up of some 80 different professions. In fact, approximately 60 percent of all health care workers are allied health professionals. According to Balas, the demand for health care workers is twice the growth of the national economy. By 2020, the U.S. will require 20 million health care professionals. The College of Allied Health Sciences has been developing programs to support this growth since the 1930s. 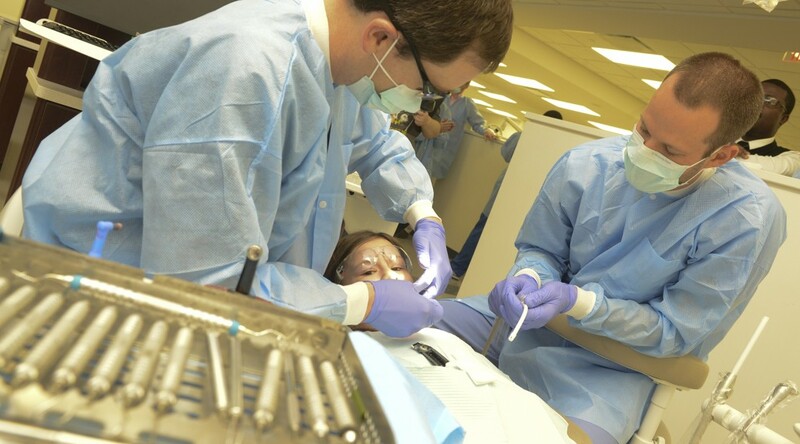 Departments within the College of Allied Health Sciences include Clinical and Environmental Health Sciences, Dental Hygiene, Health Management and Informatics, Medical Illustration, Medical Laboratory, Imaging and Radiologic Sciences, Occupational and Physical Therapy, and Physician Assistant. Graduates of these departments enjoy a nearly 100 percent employment rate. While active development of the doctoral degree in applied health sciences started about two-and-a- half years ago, Balas said the program had been a dream of the college, its faculty, and his predecessors for a long time. Though many students will come from the local population, Balas said he expects to draw from across the state and nation, eventually even including international enrollment. With a mix of distance technology and on-campus work, Balas believes the program’s flexibility will appeal to students from all locations, and he hopes its practical focus will attract results-driven practitioners. All of which dovetails with the type of students Balas expects to join the program, which debuts in the fall. 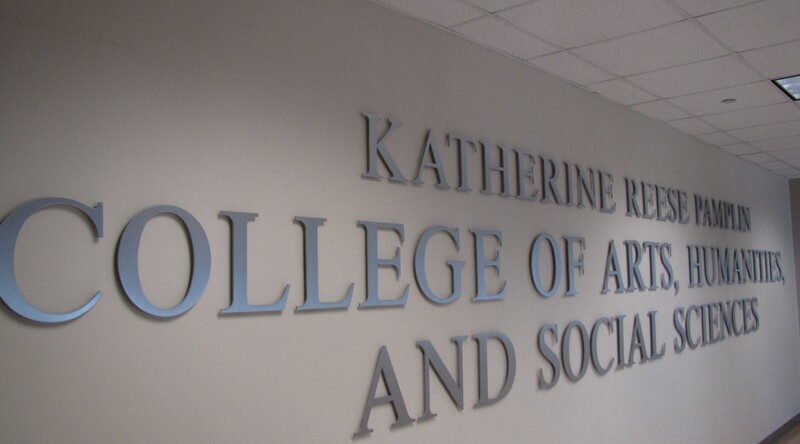 For more information, visit the College of Allied Health Sciences here. Last August, the Pamplin College of Arts, Humanities, and Social Sciences received $76,000 to support the presentation and dissemination of faculty scholarship and creative works. Dubbed the “Pamplin Professional Impact Fund,” or “PPIF” for short, the pilot project helped 56 faculty members present approximately 100 papers, projects, and exhibitions at respected conferences around the world, as well as to conduct research. The funds were awarded through a competitive application process conducted by a committee comprised of both junior and senior faculty from across the college. Seventy-five separate awards were made, ranging from $100 to $2,500 and covering, on average, 75 percent of the faculty member’s travel costs. Several of the programs have an international component. For example, Dr. Andrew Goss, Chair of the Department of History, Anthropology, and Philosophy, presented in Singapore, and art professor Dr. Michael Schwartz is planning to fly to Iceland to attend the annual meeting of the Comparative and Continental Philosophy Circle, where he is co-founding Executive Lead Officer and serves as this year’s Program Chair. Many of the projects funded are also expected to lead to peer-reviewed publications that will help to raise the institutional profile of GRU. At least two of the funded projects have already led to book contracts, while five more have been accepted for publication in journals that include Mediterranean Quarterly, Questions in Politics, and International Journal of Linguistics, Literature, and Culture. Several more have been solicited for review. 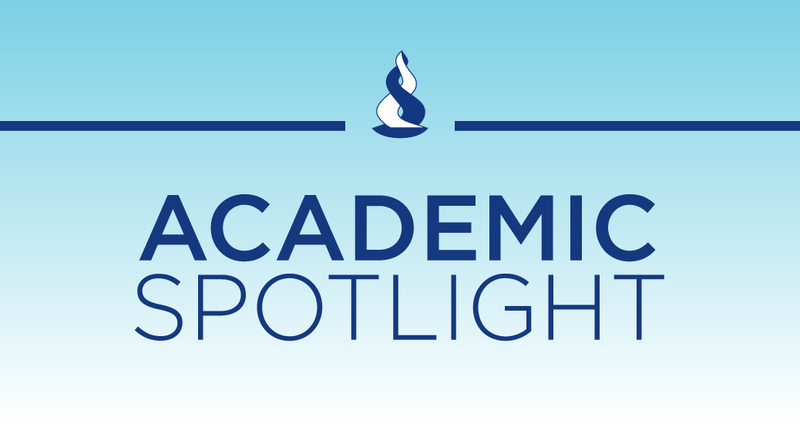 Faculty have also reported networking with top scholars in their field and being invited to organize or present at future conference proceedings, as well as to hold offices in national associations. AUGUSTA, Ga. – In recognition of National Nurses Week, Georgia Regents University and Health System have more than a dozen events planned to highlight and thank nurses for their contributions to quality patient care. National Nurses Week begins each year on May 6 and ends on May 12, the birthday of Florence Nightingale, the founder of modern nursing. 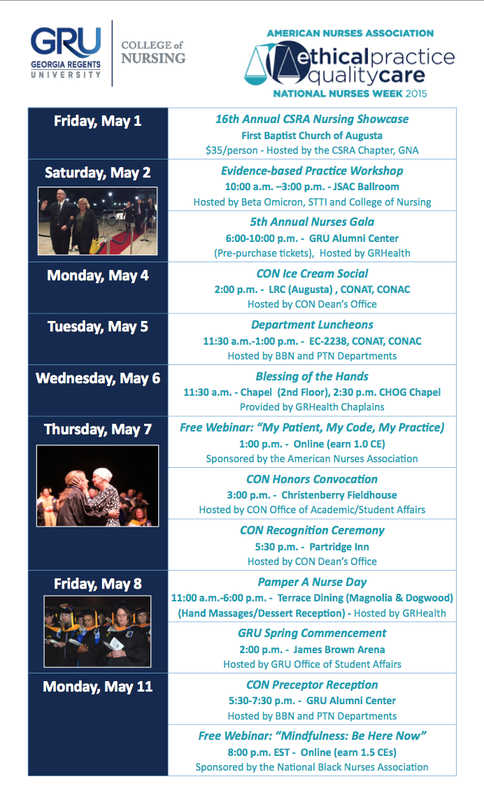 GRU’s College of Nursing events include an ice cream social, workshop, departmental luncheons, and two educational webinars. 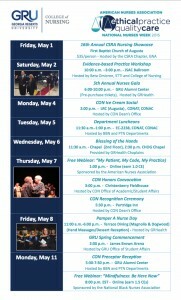 In addition, the CON Honors Convocation is scheduled for 3 p.m. Thursday, May 7, at Christenberry Fieldhouse, and commencement is 2 p.m. Friday, May 8, at James Brown Arena. GRHealth events include dessert receptions, Doughnut Day, a white-out, GRU Blue Day, and multiple unit-specific events. Shared events during the week are the annual Blessing of the Hands, Pamper a Nurse Day, and a preceptor reception. On Wednesday, May 6, hospital chaplains will walk from unit to unit to share blessings, anoint the hands, and pray with nurses and other staff members beginning at 7 a.m. and ending with a 2:30 p.m. service in the Children’s Hospital of Georgia Chapel. On Friday, nurses will be treated to hand massages in the Dogwood and Magnolia Rooms of the Georgia Regents Medical Center cafeteria from 11 a.m. to 6 p.m.; and on Monday, May 11, nurses will wear traditional white for a Nurse Preceptor Reception from 5:30 to 7:30 p.m. at the GRU Alumni Center. 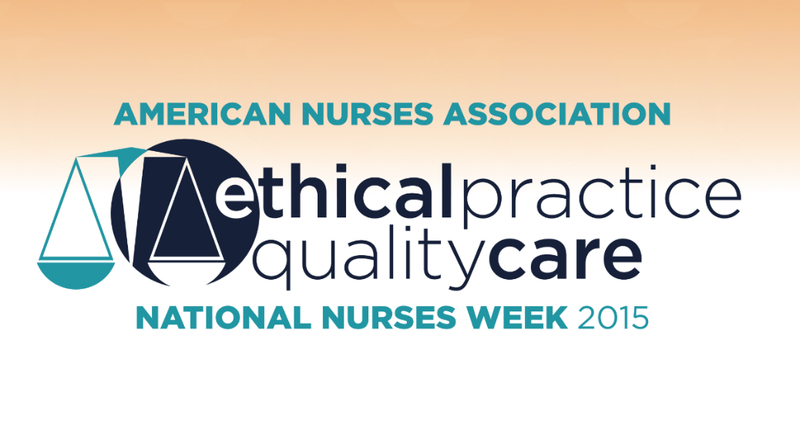 This year’s National Nurses Week theme is “Ethical Practice. Quality Care.” It underscores the importance of ethics in nursing and acknowledges the strong commitment, compassion, and care nurses display in their practice and profession. The theme is an important part of the American Nurses Association’s Year of Ethics outreach to promote and advocate for the rights, health, and safety of nurses and patients. Members of the media should contact Denise Parrish at 706-831-3148 or mparrish@gru.edu; or Kelly Jasper at 706-513-0719 or kjasper@gru.edu; to arrange the best opportunities for media coverage during Nurses Week. 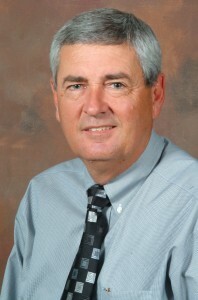 Dr. James L. Olds, Assistant Director for the Directorate for Biological Sciences (BIO) for the National Science Foundation, is the keynote speaker for the 2015 Hooding Ceremony of the Medical College of Georgia at Georgia Regents University. More than 200 of Georgia’s newest physicians will participate in the ceremony, planned for 2 p.m. Thursday, May 7, at the Augusta Convention Center on Reynolds Street. BIO supports research that advances the frontiers of biological knowledge, increases our understanding of complex systems, and provides a theoretical basis for original research in many other scientific disciplines. 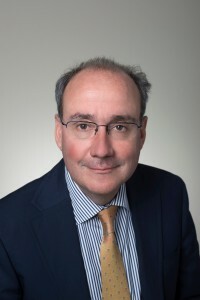 Olds served as Director and Chief Academic Unit Officer at the Krasnow Institute for Advanced Study at George Mason University for 15 years prior to his appointment at the NSF. The Decade of the Mind project, an international initiative to advance scientific understanding of how the mind and complex behaviors are related to the activity of the human brain, was begun under his leadership at Krasnow. That work helped shape President Obama’s BRAIN Initiative. He is Chair of the Molecular Neuroscience Department and the Shelley Krasnow University Professor of Molecular Neuroscience at George Mason University. From 2010-11, and from 2013-14, Olds was Chair of GMU’s Neuroscience Advisory Council. Since 2005, he has served as Editor-in-Chief of The Biological Bulletin, which is published by the Marine Biological Laboratory in Woods Hole, Massachusetts. Olds serves on numerous private and public boards and has played a central role in scientific public policy development at all levels, ranging from the Commonwealth of Virginia and the White House to advising heads of ministries internationally. He spent eight years as Chair of Sandia National Laboratory’s External Cognitive Science Board. In the non-profit world, Olds was Treasurer of Americans for Medical Progress. Prior to his leadership role at Krasnow, Olds was the CEO for the American Association of Anatomists. He received his undergraduate degree from Amherst College in chemistry and his doctorate from the University of Michigan in Ann Arbor in the field of neuroscience. His postdoctoral research at the National Institutes of Health led to advances in understanding the molecular basis of learning and memory, and he received the NIH Merit Award in 1993. The hooding ceremony signifies a scholarly personal achievement. Graduated members (senior leaders, faculty, and special hooders) of the profession place the hood on the student as a symbol of their passage from student status to graduate status. The hoods of the Medical College of Georgia are worn proudly with silver, blue, and red as well as the color of medicine, green. A new academic home; a 15 percent increase in medical school applicants; a record-in-recent-history number of seniors choosing the Medical College of Georgia and GRHealth for their residency training; an unprecedented amount of clinical growth; and robust research in a tough funding time. Buckley lauded faculty, students, staff, and residents across MCG’s four campuses as well as alumni who populate the state and nation for the dynamic state of Georgia’s public medical school. He thanked as well physicians, hospitals, and communities across Georgia that have embraced MCG students and enabled a true statewide educational network. “We have many, many homes across the state, both physically and metaphorically,” Buckley said of three clinical campuses in southwest, northwest, and southeast Georgia, as well as a second four-year campus, the GRU-UGA Medical Partnership in Athens. This year, the Southwest Campus, based in Albany, celebrates a decade of operation, the second cohort of students who attended the Athens campus graduate next week, as do the first group of students who spent their clinical years in the newest campus, based in Rome. At the home base in Augusta, the new J. Harold Harrison, M.D., Education Commons, continues to draw rave reviews from students, educators, and visitors alike. A recent reviewer for the Liaison Committee on Medical Education commented that he had not seen it’s match in the country, Buckley shared. That state-of-the-art facility coupled with a long history of educational excellence has helped generate the unprecedented interest in MCG, said Buckley, noting that the 15 percent increase in medical school applicants this year at MCG compares with a 4 percent increase nationally. The energy and synergy permeate the clinical and research arenas as well. Again bucking national trends, MCG and GRHealth are sustaining unprecedented clinical growth while addressing roadblocks such as cancelled clinics. “We have continued to stay focused, continued to stay robust and develop a research program in probably the most adversarial time in the history of the National Institutes of Health,” Buckley said, encouraging everyone to be proud of their research colleagues. A Medical College of Georgia graduate and pediatric surgeon, who chairs the Department of Surgery, and the longtime administrator of Phoebe Putney Health System, home of MCG’s first clinical campus, were honored Friday by Dr. Peter F. Buckley, Dean of MCG at Georgia Regents University. Dr. Charles G. Howell, a 1973 graduate and advocate for children and families who has served as Chief of the MCG Section of Pediatric Surgery for more than 20 years and Chairman since 2011, received the Professionalism Award during Buckley’s May 1 State of the College Address. Joel Wernick, Phoebe’s President and CEO for more than a quarter of a century, received the Dean’s Community Advocate Award. “Dr. Howell is an amazing advocate and consummate professional when it comes to the care of children and their families,” Buckley said. “In his more than 30 years as a faculty member, he has never swayed for even an instant from his core belief that our youngest patients deserve the absolute best. Howell helped plan and develop the Children’s Hospital of Georgia, which opened in 1998. He designed the facility’s operating rooms, and has served as Medical Director of Operative Services since the hospital opened. He is also Surgeon-in-Chief and Co-Medical Director of CHOG. Howell has co-directed the extracorporeal membrane oxygenation, or ECMO, program for children in respiratory failure at the children’s hospital and helped found the program in 1985 as one of the first in the nation. Howell helped advocate bringing a Ronald McDonald House to Augusta in the 1980s, and he and his wife, along with Braye and Tori Boardman, co-chaired the fundraising campaign for the new house, which opened just steps away from CHOG in January. 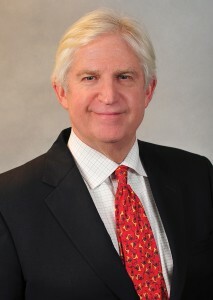 Wernick is consistently ranked by Georgia Trend magazine among the 100 most influential Georgians. The Arkansas native is on the board of VHA-Georgia and a former board member of VHA, Inc., a national network of not-for-profit health care organizations; the Georgia Alliance of Community Hospitals; and the Georgia Chamber of Commerce. He chairs the Southwest Georgia Alliance for Progress, a regional coalition to strengthen economic, educational, and cultural infrastructures that support the Marine Corp Logistics Base of Albany. He is a long-time Rotarian and Paul Harris Fellow. The Southwest Campus is part of MCG’s regional campus network that has students living and learning across Georgia. The Albany-based campus has third- and fourth-year medical students working with physicians and hospitals throughout that quadrant of the state, including Albany, Tifton, Cordele, Valdosta, LaGrange, Americus, Thomasville, and Columbus. Ana Thompson, Chair and Professor of GRU’s Department of Dental Hygiene, is presenting a new way to teach kids about the importance dental hygiene. Click here to watch her share details with WJBF about her coloring book Keeping up with your smile. 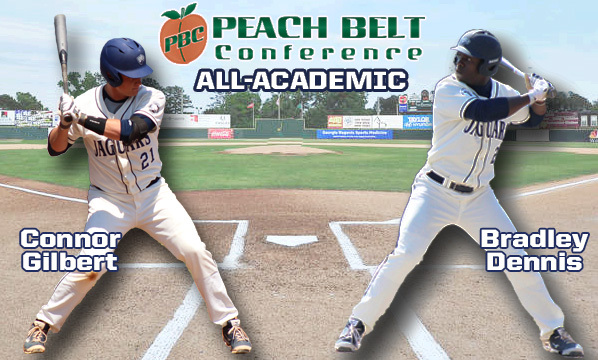 The Peach Belt Conference released the baseball All-Academic team from the conference office in Augusta on Thursday afternoon and GRU Augusta baseball senior Bradley Dennis and junior Connor Gilbert were named to the team for their performance in the classroom during the 2015 season. Bradley Dennis, a senior criminal justice major from Stone Mountain, Ga., is hitting .255 his senior year and has recorded 12 runs and 12 hits. Dennis is a perfect 4-4 on stolen bases this season and he has a .310 slugging percentage with four RBI. Connor Gilbert, a junior from Woodstock, Ga., is hitting .317 in his second season as a Jaguar with 40 hits and 16 scored runs. Gilbert has driven in 16 runs and has a .397 slugging percentage. He posted five doubles and one homer and triple. To be eligible for the All-Academic team, a student-athlete must 1) participate in at least half of his/her team’s events and be either a starter or significant contributor; 2) achieved a 3.30 cumulative grade point average (on a 4.0 scale) and 3) completed at least one full academic year at his or her current institution and has reached sophomore athletic eligibility.